The only sewing instructions are these, printed on the back of the envelope. Cutting instructions are shown later in this post. 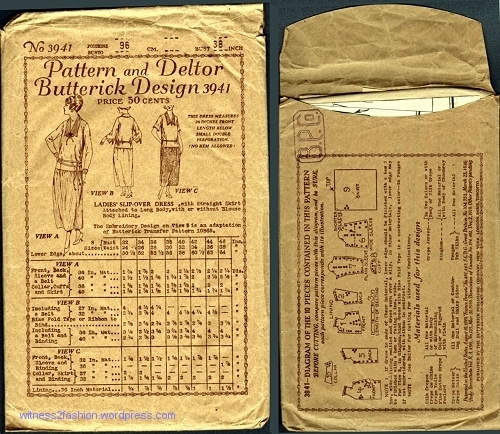 When Butterick and other companies began to include an instruction sheet early in the 20th century — they were called by many names, such as Butterick’s “Deltor” or McCall’s “Printo Gravure” — home sewing became a lot easier. 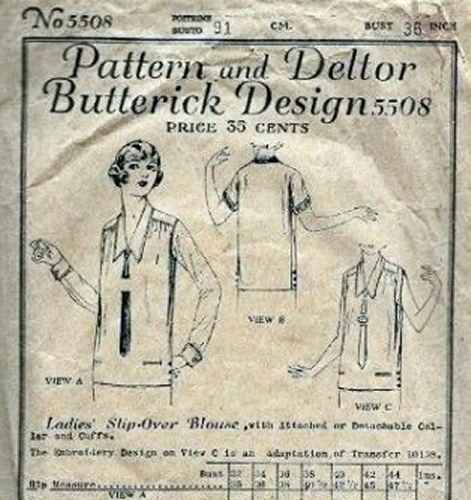 Butterick “Pattern and Deltor” 3981, early 1920’s. You can see a bit of the printed Deltor instruction sheet peeking out of the envelope back. 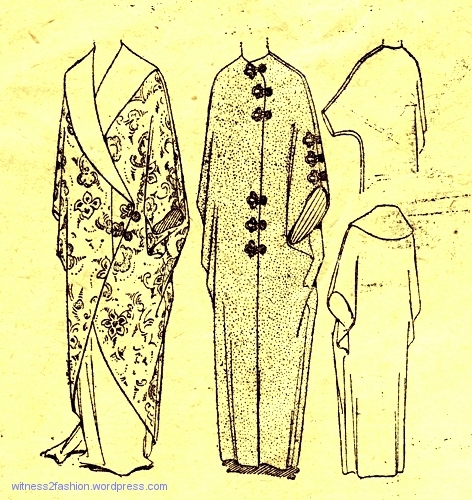 This McCall coat pattern from 1928 was printed with cutting and stitching lines, and included the Printo Gravure instruction sheet. 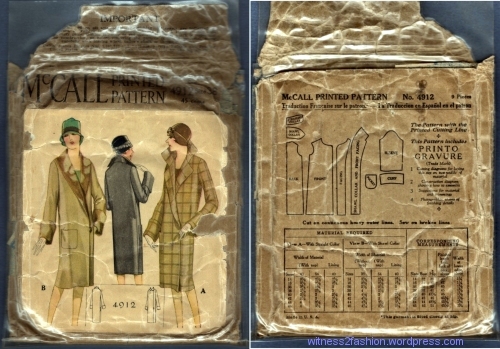 McCall coat pattern 4912 dated 1928. Someone has coated the envelope with clear plastic to keep it from crumbling. 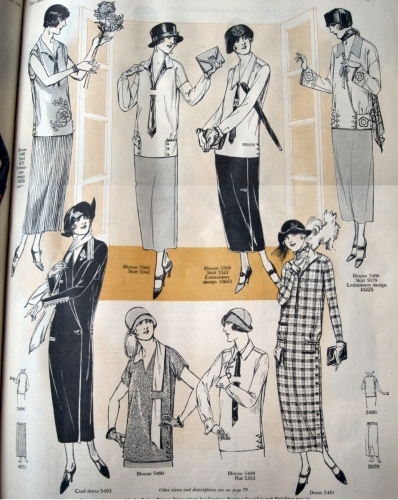 McCall pattern and Printo Gravure, #4912, dated 1928. With earlier patterns, the only instructions you got were the ones that fit on the outside of the envelope which the unprinted pattern came in. It was not usually a very big envelope, either, so the print was hard to read. 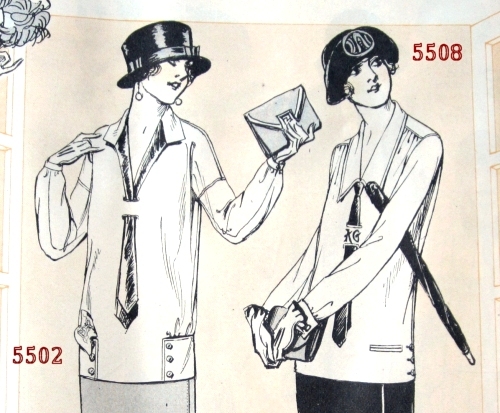 Pictorial Review blouse pattern #9186, late 1910’s or early 1920’s. The envelope was narrower than a modern pattern envelope, perhaps 5 inches wide. 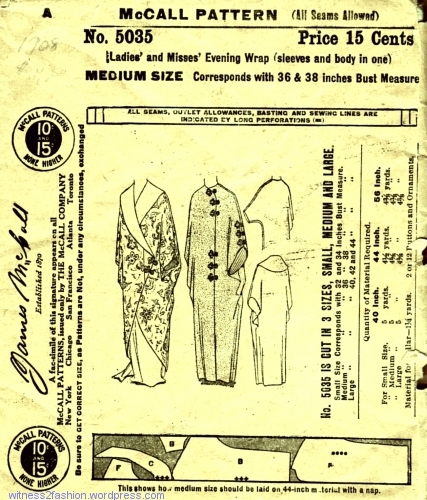 On this early 1900’s – 1910’s McCall evening coat pattern, all the instructions supplied for cutting and sewing don’t even fill the back of the envelope. 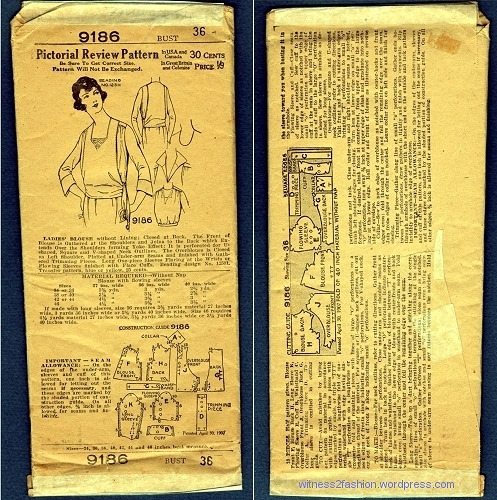 Front and back of envelope, McCall pattern 5035. No other instructions inside. Unprinted patterns were usually perforated (as if by a hole punch), so the pieces — pre-cut at the factory — were marked A, B, C, or II, III, IV, (or B and F, like this one) with a series of small punchholes. But the wise dressmaker immediately marked the front of each piece with a pencil to prevent accidentally using them wrong side up. This pattern did not assign one letter per piece, but just marked them B (back,) C (collar) or F (front.) The small piece marked F is the sleeve front; the small piece marked B is the sleeve back. Just as modern patterns offer variations (View A, View B, etc.,) this pattern can be cut in different styles. McCall Evening Wrap pattern No. 5035, process patented in 1908, but this pattern may be later. Cutting instructions for different views. McCall 5035. McCall 5035. It’s not easy to reconcile the illustrations on the front with the ones on the back of the envelope. 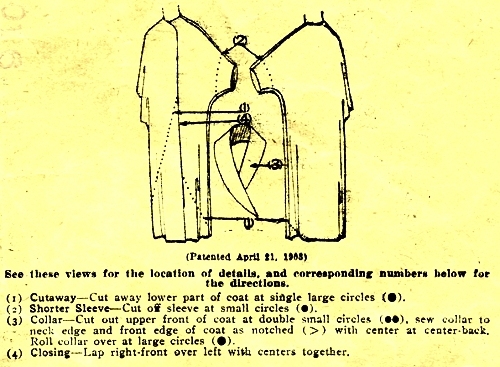 The seam connecting the sleeve to the coat is not illustrated, either. 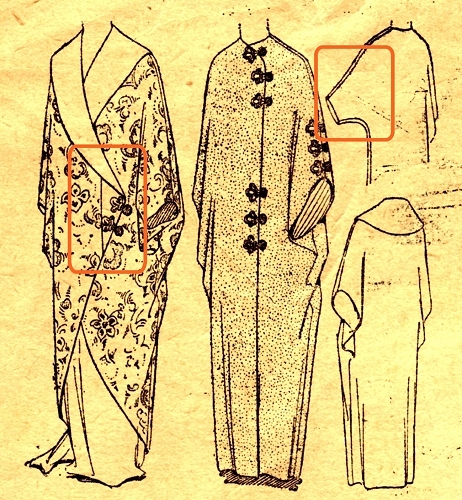 There is no mention of a lining, but the coat could not look like this without one. 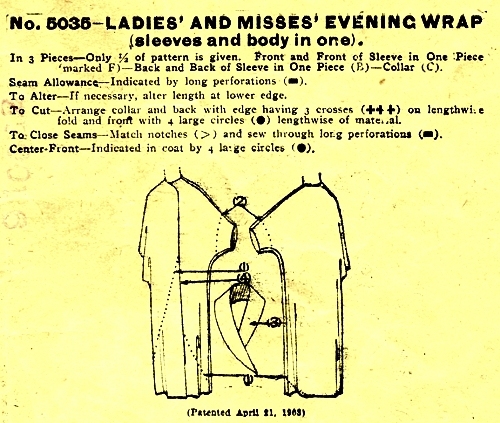 The dressmaker who used this pattern had to know a lot more than a stitcher needs to know today. Count Your Blessings . . . .
Modern patterns tell us not only the yardage needed for the garment but also the yardage for linings and interfacing, plus notions like zippers and shoulderpads, and suggested fabrics. We’re used to illustrations of each step, not merely verbal instructions. As a beginning stitcher, I would have been completely bewildered when I found that the collar piece didn’t line up with the coat front. I wouldn’t have realized that the coat needed a lining or facings (not included or mentioned.) And surely the version with a collar could use interfacing. Looking back, I realize that I learned a lot about sewing from following illustrated pattern instructions. 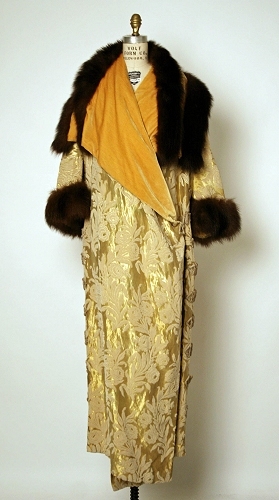 Evening coat by Doucet, 1910. Photo courtesy of the Metropolitan Museum. 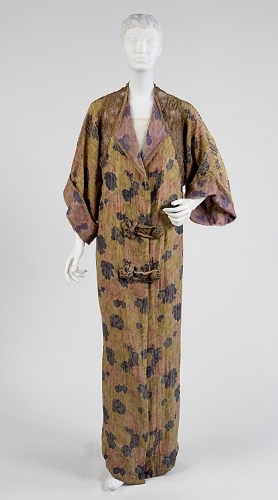 Evening coat by Paul Poiret, 1912. Photo courtesy of the Metropolitan Museum. The McCall pattern calls for similar frog closings. 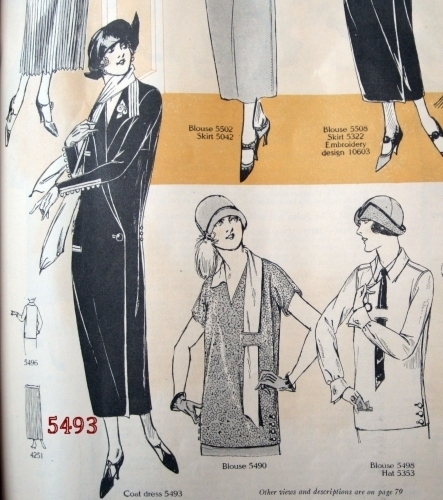 If you have an undated Butterick pattern from the 1920s or 30s, you can probably use my new website, witness2fashion.com, to find the month and year when it first appeared in Butterick’s magazine, The Delineator. 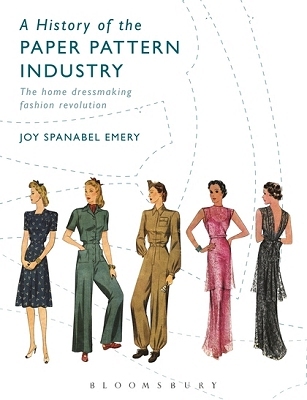 Vintage patterns are a wonderful resource for researching vintage fashions and costume history, but very few pattern companies used to date their patterns. 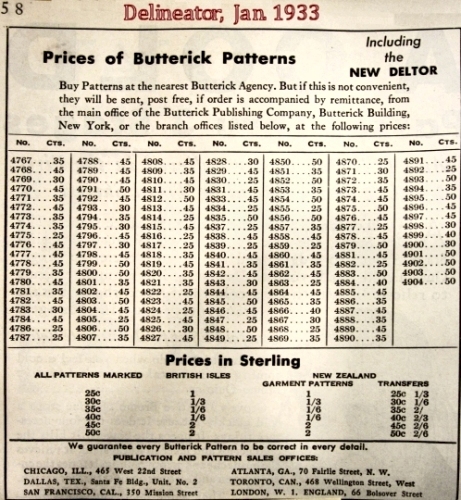 Butterick resisted dating its patterns for decades. My project is to make dating them easier for collectors and historians. I have been working on this project for over a year, ever since I discovered that, in the 1920s and 1930s, there was a chart near the back of every Delineator, listing all the patterns illustrated in that issue. This was for the convenience of customers who wanted to order by mail. I have collected that information from over 150 issues, from January 1924 to March 1937, and published it for the use of vintage pattern collectors and sellers, and of course, for historians who need to track the development of styles. 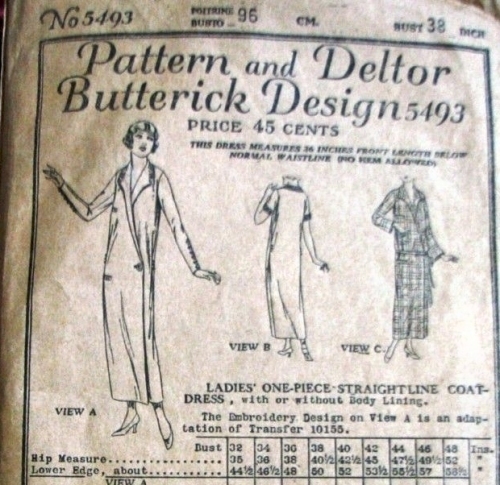 If you have a 1920s style pattern with a number between #5721 (December, 1924), and #6507 (December, 1925), you can be sure that pattern was first offered for sale in Butterick’s Delineator magazine in 1925. You can even find the month and issue, which is useful for charting changes in hemlines, etc. This pattern, #5493, is currently listed on Ebay by Bill Walton’s Antiques. It is clearly a 1920s style. Its number — 5493 — dates it to September, 1924. And here is a photo of the original listing in The Delineator, September issue, 1924. Mr. Walton has said, quite accurately, that his pattern #5493 has a patent date of 1921. 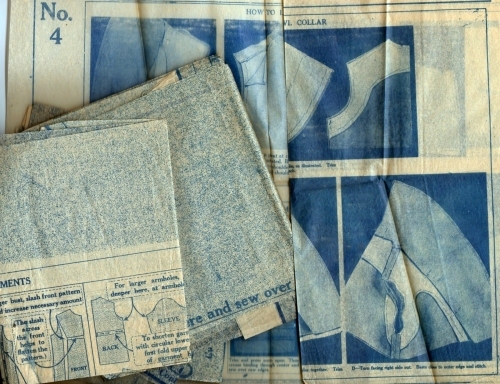 In her excellent article about Mc Call’s patterns, De-coding Vintage Patterns, the Wearing History blogger explained that a patent date may refer to the pattern’s mechanical process or printing process, not the design itself. It is not the same as the copyright date on a modern pattern. 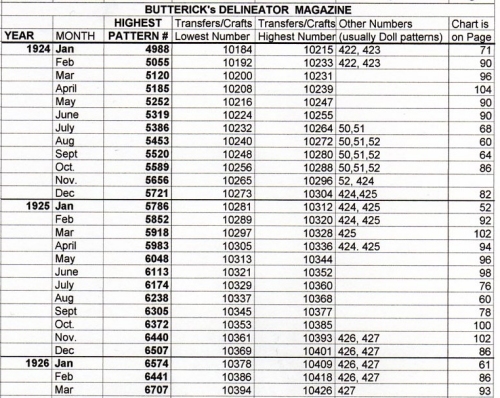 The witness2fashion.com charts show the month and year when the Butterick Publishing Company first illustrated and described each sewing pattern it was offering for sale. They may have been available in stores a little earlier, but being featured in the magazine means the fashion was current. 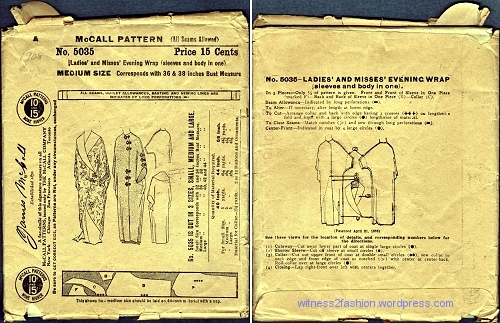 Statistically, the chance of my finding two vintage patterns currently for sale on Ebay which date to the same issue of The Delineator was pretty small, but, incredibly, they also appeared on the same page. Even more amazing: by pure serendipity, I happen to have photographed the very page they appeared on just last week! There are so many great blouses on that page that I can’t resist describing them, too, in a later post.